Sendai Girls has announced the brackets and schedule for their second annual Jaja Uma tournament for juniors. If the field and especially the outside wrestlers seem a little lackluster, that's because it is. Of course Okuda is gone and Arisa Nakajima, Hiroyo Matsumoto & Tomoka Nakagawa are no longer juniors. The one glaring omission is JWP rookie Pinkie Mayuca. Other than that it reflects that the current junior crop isn't very good and the Sendai originals won't be juniors after this year. I know promoters like to do tournaments because they're easy to book but it also seems a little lazy sometimes. This won't be as good as last year. Opening round matches will be on Feb. 21. There are 12 wrestlers in the tournament and four get byes to round two. First round matches are Ice Ribbon's Minori Makiba vs Ibuki's Esui, Ito Gym's Hanako Kobayashi vs Hiren, Yoko Yamada vs Yukari Ichino and Ryo Mizunami vs Raika. Raika is a masked wrestler who debuted a couple of months ago and is a freelancer. Yoko Yamada is now a freelancer. She's a former arm wrestling champ and was training at Ibuki. She's very tiny and some promoters are reluctant to hire her because of that. And she does a lot of modelling. She's worked for DEEP as a ring girl. The second round matches will be on Mar. 29. 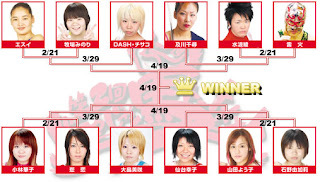 Dash Chisako vs winner of Makiba/Esui, Chiharo Oikawa vs Mizunami/Raika, Misaki Ohata vs Hiren/Kobayashi, Sendai Sachiko vs Yamada/Ichino. The semi finals and final will be on Apr. 19. Who will win? Not necessarily a Sendai wrestler. The winner could come from the Oikawa/Mizunami match. I'm not sure how sold Satomura is on Mizunami. I guess this tournament will tell us. Kobayashi has improved and could surprise and Sachiko or Dash couild win. I don't expect Hiren to get past the first round. A few of these girls aren't ready for prime time and minus Mayuca, I'm not sure the tournament means much to anyone outside Sendai.